I'm trying to get to grips with the effect of resistors and Lpads on bass drivers and particularly how they may affect the T/S parameters. 1. A single series resistor on a bass driver will attenuate output but at the same time increase the Qes and therefore Qts meaning increased system Q (sealed box) for the same size enclosure. 2. A single resistor in parallel with the driver will reduce the Qes and therefore Qts meaning reduced system Q for the same sized sealed box. Firstly, are 1 & 2 correct? Secondly, suppose that one wanted an Lpad to attenuate an 8 ohm bass driver by 6db. This would require an 8 ohm parallel resistor and a 4 ohm series resistor. If the parallel resistor exceeded 8 ohms, would it have a similar effect on Qes as a single parallel resistor as described above? Similarly, if the series resistor exceeded 4 ohms, would this have a similar effect on Qes etc as a single series resistor? this is similar to what you mention about conflicting answers. To me, resistors are intended to control/restrict current flow exclusively and there are always better methods to change filter characteristics such as any "Q" parameter-even speaker "Q" which in reality is a kind of mechanical filter, you will see that electronics and classical physics really share equivalent "components" and mathematical equations. 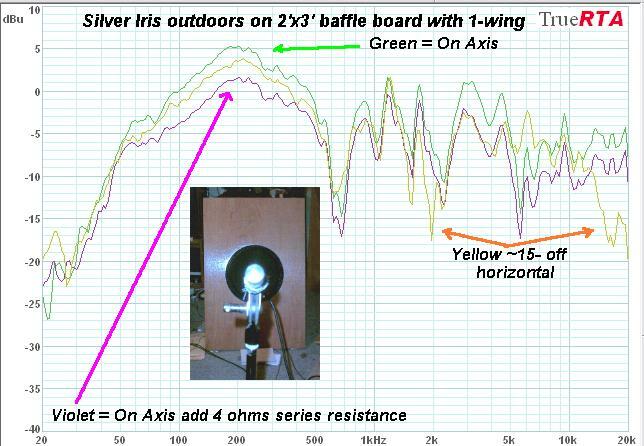 Why do you want to resist current flow to a woofer in your case instead of maybe a high pass/low pass filter and such? Disconnect the woofer and calculate the equivalent resistance of [output impedance amplfier + L pad], as measured between the wires where the woofer would connect. The output impedance of the amplifier can usually be considered to be 0, which means you would end up with both resistors of the L pad in parallel. Then calculate the increase in Qts or Qes if you would put that equivalent resistance in series with the woofer. Assuming a voltage source, 1 is correct and 2 is incorrect. Last edited by TBTL; 6th October 2017 at 07:55 AM. I suggest the following: Grab the free crossover simulator named XSim, and grab a woofer SPL and ZMA files from Parts Express. XSim has built - in Lpad calculator. I think in general, one can also think of the added resistance to a speaker in the terms of fixed leg in a two leg voltage divider where the second leg can have variable impedance due to the driver and loading combination. If the driver and load had a constant input impedance across its needed bandwidth, then the attenuation to the driver is pretty much constant. If there are significant impedance peaks, then the attenuation will be much less at those frequencies than in the region where the driver is close to its DC resistance. -there's not much "loss" at 50Hz. Last edited by freddi; 7th October 2017 at 06:01 AM.